South African venture capitalist Michael Jordaan says South African startups should focus on helping solve some of the country’s many social and economic problems, rather than develop the “stupid, stupid stuff” that entrepreneurs often pitch him. Speaking last night at an event hosted by the Creative Leadership Collective and held at the Naspers building in Cape Town, the former FNB head said more startups should seek to solve “real problems”. The collective is a members-based organisation that aims to facilitate greater innovation capabilities within large corporates. 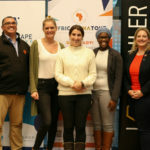 “The wonderful thing about South Africa are these problems you have, because they are all opportunities,” said Jordaan. “Instead the stuff I get — the emails I get, the people that come to me — I can promise you this, (are) ‘I can take a picture of my cat and I can make it look like a tiger’, or ‘I can send this chick a message and it can disappear and no one will know I took a funny photo of myself’, or ‘I take pictures of my food and people can rate it’. “Stupid, stupid stuff that doesn’t solve the problems we have in South Africa,” he said. Some of the problems — that the world has — he says are affordable health care, clean energy, corruption and crime, transport and education, which startups can help address. In the talk Jordaan also spoke of how corporates should embrace startups and startups culture. Essential Med: The startup offers affordable medical aid. NMRQL: The company uses artificial intelligence (AI) to outperform investment managers and so offer investors better returns. Rain: South Africa’s first data-focused network, which Jordaan says will be launched this year and aims to lower local data prices. Bank Zero: A digital bank which Jordaan aims to launch later this year (see this story). Brightblack Energy: Designs, builds, finances and manages renewable energy solutions for commercial clients. Snapplify.com: Solves textbook deliveries by making textbooks available online. Namola: Allows residents to locate the closest police van. Daily Maverick: A local news site. Jordaan helped fund the site which investigated corruption in the state, through its Gupta Leaks probe. Codex: Trains those from underprivileged backgrounds to become coders. Yet while startups can help solve many of South Africa various social and economic challenges, to do so they need to focus on solving the small things first. This, he says, is the “startup way of thinking of the world”. “In my world if someone said they are going to solve the education (crisis) in South Africa I immediately lose faith. “You can’t just solve education in South Africa. You can only say ‘I think I have got an idea that can solve it’. And I would say ‘okay, alright. Why don’t you try in one subject, in one classroom, in one school, in one brain. And if it works there we can do it in another subject, or another brain. But prove that it works first’,” he says. Furthermore, the assertion he says that young people should “follow their passion” is “misguided”. Passion alone is not sufficient to start a successful business, he points out. You need to be good at what you do and there needs to be a demand for your offering. But if you want to pitch a solid idea at Jordaan you’ll have to hurry. The venture capitalist admits that he’s “more of less” at the end of his funds. Just make sure that it’s not a stupid idea.